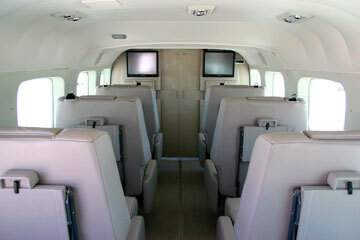 Go!Express will use nine-seat Cessna Grand Caravan 208B planes with leather reclining seats. Island Air and Pacific Wings held their ground yesterday and said go!Express' planned incursion into smaller interisland airports won't harm their operations. But Mesa Air Group's go!, which announced a code-share deal with local carrier Mokulele Airlines that involves Mokulele bringing in a new fleet of aircraft and offering low-cost fares, apparently has captured people's attention. Mokulele Chief Executive William Boyer said yesterday that his company's reservation office has received more than 100 calls from prospective passengers interested in booking flights when go!Express starts Honolulu service in December to and from Kapalua, Maui; Lanai; and Molokai. "We've also gotten calls from several mainland and foreign carriers about code-sharing," Boyer said. Pacific Wings President Greg Kahlstorf said the destinations targeted by go!Express aren't serviced very much by his company. "Those are Island Air's routes," Kahlstorf said. "This looks like a direct attack on Island Air. We're a different product. We actually believe our passengers are worth more than $29. We like high value better than high volume." Kahlstorf was referring to go! 's lowest fare of $29. Island Air Chief Executive Rob Mauracher shrugged his shoulders at go! 's new arrangement and said the code-share agreement between Mesa and Mokulele does not represent a significant change in the competitive picture. "Code-share agreements are a part of the airline business," Mauracher said. "This agreement is basically the same as Island Air's code-share agreements with Aloha, Continental, Hawaiian and United." Mauracher pointed out that Mokulele already operates flights to these destinations with eight-seat Piper Chieftain aircraft and the single-engine Cessna Caravans that Mokulele intends to use have nine seats -- adding just one more seat per plane. "We don't believe the agreement will significantly change the marketplace in the near future," he said. "Island Air's business plan is solid. Our focus remains on serving Hawaii with more point-to-point service and off-peak travel options than any other airline." Hawaiian Airlines and Aloha Airlines both declined comment yesterday about go! 's new venture. They already are dealing with the lower fares that go! has introduced to the interisland market. Boyer, who bought Mokulele Flight Service last October and recently changed its name to Mokulele Airlines, acknowledged that Mokulele, which will operate as go!Express, won't represent an immediate threat because it will have only two of its new aircraft by the end of the year. Boyer has an option to purchase seven more planes in 2007. "I don't see the direct competition; not right now," he said. "Anytime you have more planes going into a market, it raises the eyebrows of all carriers. I always thought competition was good." Last year, Boyer contacted Kahlstorf about a possible deal that would allow Mokulele to fly as a scheduled service operator, but the two were never able to reach an agreement.